Patients with psoriasis face numerous treatment and self-management decisions. Shared decision making is a novel approach where patients’ preferences and values are considered in cooperation with healthcare professionals before making treatment decisions. 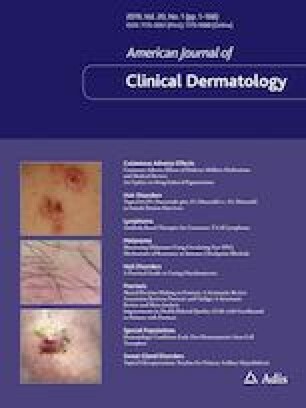 The objective of this systematic review was to explore what is illuminated in psoriasis research regarding shared decision making, and to estimate the effects of shared decision-making interventions in this context. Qualitative, quantitative, and mixed-methods studies were eligible for inclusion. We searched six electronic databases up to January 2018. Two reviewers independently applied inclusion and quality criteria. The SPIDER framework was used to identify eligibility criteria for study inclusion. Narrative and thematic syntheses were utilized to identify prominent themes emerging from the data. A total of 23 studies were included in the review. Of these, we included 18 studies (19 papers) to describe what was illuminated with regard to shared decision making in psoriasis research. Four major themes emerged: interpersonal communication; exchange of competence and knowledge; different world view; and involvement and preference, organized under two analytical themes; “Co-creation of decisions” and “Organization of treatment and treatment needs”. For shared decision-making effects, we included four controlled studies. These varied in scope and interventional length and showed limited use of shared decision making-specific outcome measures, reflecting the early stage of the literature. Because of study heterogeneity, a meta-synthesis was not justified. There appears to be a need to strengthen the relationship between medical doctors and patients with psoriasis. The evident lack of knowledge about each other’s competence and the lack of self-efficacy for both patients and providers challenges the basic principles of shared decision making. The effects of shared decision making in psoriasis are inconclusive, and more research appears necessary to determine the possible benefits of shared decision-making interventions. The online version of this article ( https://doi.org/10.1007/s40257-018-0390-5) contains supplementary material, which is available to authorized users. Marie Hamilton Larsen, Kåre Birger Hagen, Anne Lene Krogstad, and Astrid KlopstadWahl have no conflicts of interest that are directly relevant to the contents of this article. Stacey D, Legare F, Col NF, Bennett CL, Barry MJ, Eden KB, et al. Decision aids for people facing health treatment or screening decisions. Cochrane Database Syst Rev. 2014;(1):CD001431. https://doi.org/10.1002/14651858.cd001431. Coulter AC, Collins A. Making shared decision making a reality: no decision about me, without me. London: The King’s Fund; 2011. https://www.kingsfund.org.uk/sites/default/files/Making-shareddecision-making-a-reality-paper-Angela-Coulter-Alf-Collins-July-2011_0.pdf. Accessed 6 Nov 2017. The Cochrane Collaboration. Cochrane handbook for systematic reviews of interventions. 2011. http://handbook.cochrane.org. Accessed 19 Sept 2018. McDougall A, Edhlund B. Nvivo 11 essentials. 1st ed. 2016. http://Lulu.com. Accessed 5 Sep 2017.